The Jelly Bean Prints and Batiks Arrived! Laundry Basket Quilts for Moda. 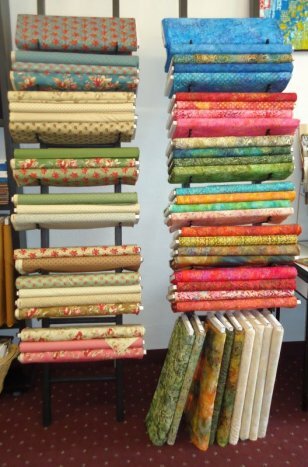 The Jelly Bean fabric collection is the perfect eye candy for quilters, bursting with flavors like watermelon pinks, kiwi greens, blueberry blues and lemon yellows. As soon as you get them in your hands, you're sure to enjoy every flavor individually or as a group. There is no stopping, as you find yourself reaching into this candy dish of fabrics again and again for more! 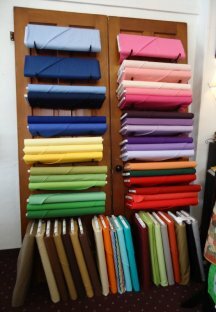 Awaken all of your senses with every swatch and let yourself be carried away into this sweet world of Jelly Bean fabric. This Shimmer line encompasses an extensive range of exquisite textures in vibrant colors with metallic accents. Shimmer is the premier collection for Artisan Spirit, the latest Northcott brand designed for the inspired quilter. Designed by Deborah Edwards you're going to love the pretty bundles that have just arrived in the store. 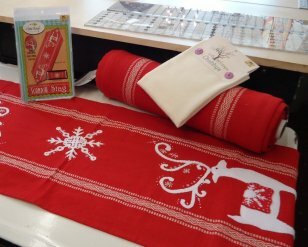 I know we don't want to think Christmas just when the sun is starting to shine, but we had to share the Scandinavian Christmas Toweling that just arrived. 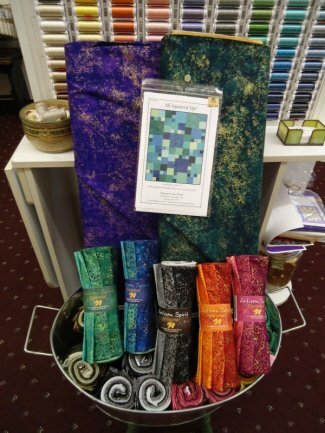 This 16" toweling is great for Christmas table runners, towels, pillows and many craft projects. 100% cotton and it is already hemmed on the edges. The Scandia Stag Runner is made out of this. 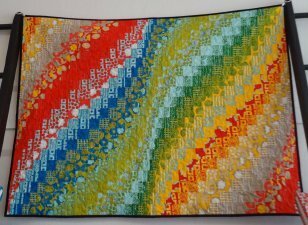 Created from a jelly roll there are three different designs you can choose from. 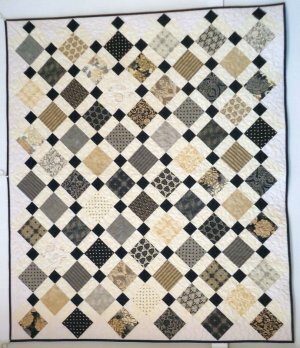 It looks complicated but rest assured if you stay organized during cutting which we will help you with, you can create this awesome quilt. Sign up today. 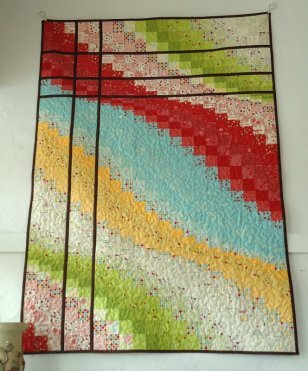 Class Fee: $95.00 which includes the pattern & fabrics to complete the quilt top & binding. This Special Class & Pricing is limited to only 6 students. Prom season is upon us so why not have a quilting prom for yourself. You will be dressed to the nines in your little black dress and create a quilt to hug you when you're all done. Not every prom date ends with a hug, but yours certainly will. 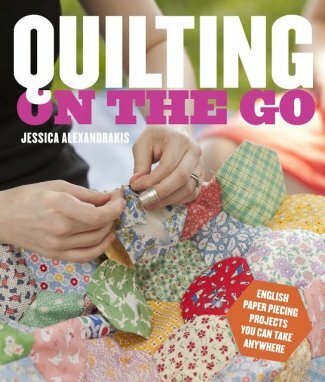 We are excited to announce that Jessica Alexandrakis, the author of Quilting on the Go, will be stopping by the store for a hands-on lecture and trunk show on English Paper Piecing. More information will be coming out next week regarding this wonderful event. We hope you will be able to join us. 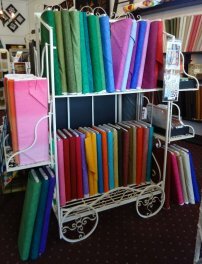 Please take the poll on our website and let us know if you have ever done English Paper Piecing or would at least like to learn more about it. Click HERE to take the poll. 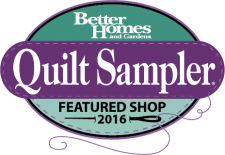 for us to attend the Spring Quilt Market. start arriving in the store that we have picked out just for our customers!